Safe web browsing is very important nowadays as we get more and more malicious and untrusted websites on Internet, and those malicious websites would be harmful to your computer by installing malware, spyware, worm, keylogger, back door or other malicious programs after visiting those websites. If not, those might be fake banking or financial websites that trick you to key in your online banking username and password that will cause you financial loss later. Therefore if you are able to know how trusted the websites that you surf or the reputation of websites real time, you will then be able to avoid from doing web surfing on those malicious or untrusted websites. Question, is there a tool that provides the feature I mentioned? Yes, there is, it’s Web of Trust (WOT). The WOT is a free add-on that can be installed in the Firefox, Internet Explorer, Google Chrome, Opera and Safari Internet browsers. 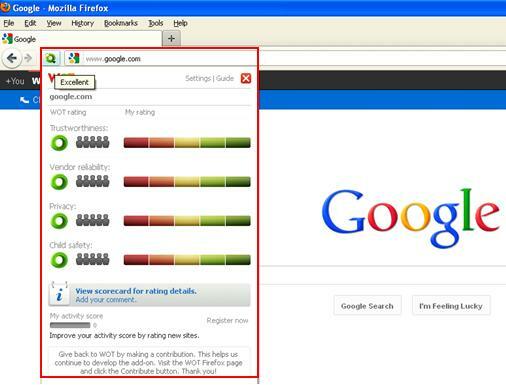 It shows you which websites you can trust for safe surfing, shopping and searching on the web based on other users' experiences and carefully chosen trusted sources, such as phishing and spam blacklists, so that you know which website you can surf safely and which poor reputation website you should avoid from exploring or surfing. Without wasting more time, let me show you how to use WOT for safe web browsing in Mozilla Firefox browser. 1) First, you need to download and install free WOT add-on here according to types of web browsers you use. You need to restart the web browser in order to use this add-on. 2) Once you have restarted the web browser, the WOT icon will be displayed next to your address bar. The WOT icon will change to different color to indicate the reputation of the website you surf: Green indicates that the site is trusted by the community, yellow warns you to be cautious and red indicates potential danger. A gray symbol with a question mark means that there are not enough ratings to calculate. You can see the complete list of WOT icons here. 3) As an example, I surf www.google.com, I then click on WOT icon to find out the reputation of this website. The reputation is shown in Green (Excellent) in four categories (Trustworthiness, Vendor reliability, Privacy, Child safety), overall I know that this website is trusted and safe to visit. 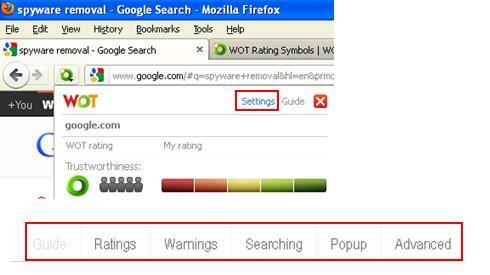 4) WOT Safe Search feature is another WOT feature that I like very much: When you do web searching by using Google, Yahoo, Bing or other search engines, the search result will be shown with WOT icon to tell you the website reputation. 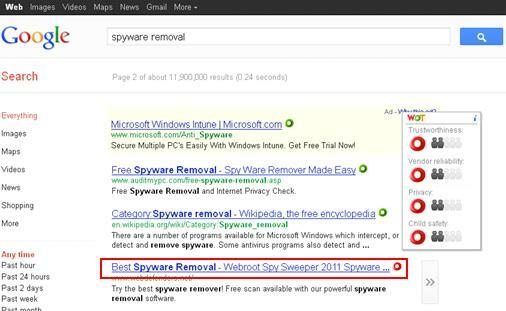 If you look at example below (Google search on spyware removal), I will never click on the link with red WOT color since it got very poor reputation, very likely it offers real spyware or malware for download. 5) If you want to configure WOT settings, click on Settings as shown below, you will be able to change the settings in Ratings, Warnings, Searching, Popup and Advanced sections. 6) If you want to contribute more, feel free to register as a WOT user (optional) and you will be able to leave comment or rate the websites you visited. That’s it on how to use WOT for safe web browsing! Hope you like it! Return to top of "Safe Web Browsing by Using Web of Trust (WOT)"!! Copyright © Home-Network-Help.com All rights reserved.